On Thursday, I took the day off to have a mental health day and spend it with my best friend. We took a day trip to D.C. and Annandale, and I made a quick video using the snaps from my IG and Snapchat story. First, we stopped by Bread Garden in Newport News to get some breakfast…and lunch. We just got a few things of bread and kimbap. It was a good thing that I bought the kimbap because midway through the rest of the drive up to D.C., it was practically lunch time. We finally reached D.C. and it was a b**** trying to find parking around the Smithsonian Institution National Museum of Natural History. We eventually found parking and started walking towards the museum. It was awesome to find out that admission into the museum was free, but they were doing heavy bag searching. The first thing we did was wander around the Mammal and Ocean exhibits. It was like being in the zoo, but with taxidermy animals. Then, we went to the second floor to see the bones of animals, which eventually led us into Nicki’s favorite part of the museum which was the mummies. After seeing the mummy exhibit, we went straight into the dinosaur exhibit and found a “fossilized T.rex poop”, which obviously wasn’t real. But it was still pretty amusing that they included it in the exhibit. The last thing we did before leaving the museum was see the Hope Diamond, which was 45.52 carats! After the museum, we went towards Annandale, which is basically Virginia’s Korea town and just 15 minutes away from D.C. 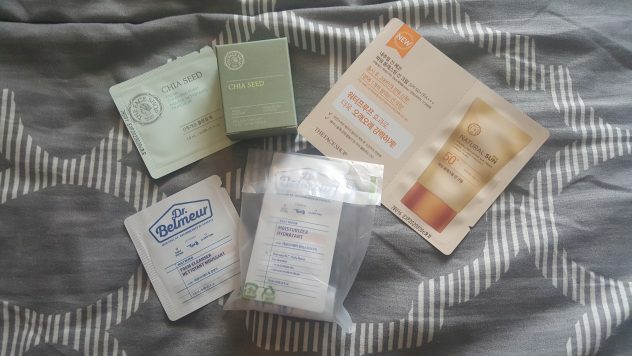 The first place we went to was The Face Shop, which was heaven for face masks and other skin care products. Then, we went to Lil’ Thingamajigs nearby and it was so hard to shop in there. They have things from K-pop merch, to cute home decor and stationery, to jewelry and other accessories. I was having a difficult time around the K-pop albums because I couldn’t decide between the latest Monsta X albums that came in 2 different repackages for Shine Forever, and then I couldn’t decide if I should get another album because K-pop albums are pretty expensive. 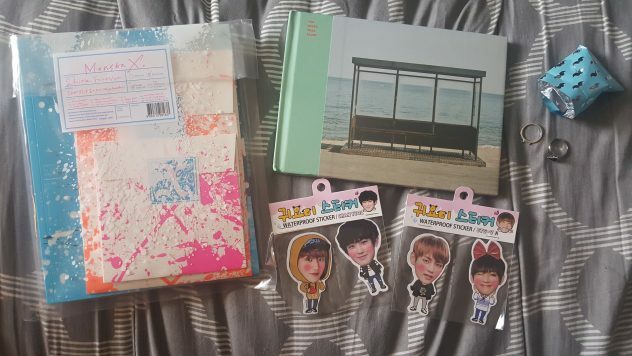 But I eventually caved in and got BTS’s You Never Walk Alone album. I got a couple of other small things, but those albums took up the bulk of my spending there. After shopping for a bit, we went to eat dinner at Honey Pig. Samgyeopsal and bulgogi all around. Ssam and soju. By the way, 2 shots of soju already got me feeling loosey goosey that night. I wish I could eat like that every single day of my life. After dinner, we went to Shilla Bakery to get dessert and bring some bread to-go. We shared a mint chocolate chip bingsoo, which had strawberries and marshmallows in it, which was unexpected, but we weren’t complaining. It was amazing! Both of us suffered from food coma as we headed back home. So Nicki drove us back for the first hour or so, then she was starting to nod off. Then I took over the wheel for the rest of the way. 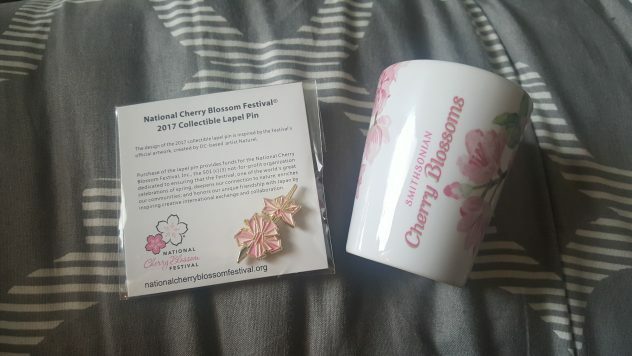 My souvenirs from the Smithsonian Museum of Natural History: Cherry Blossom Collectible Lapel Pin and Cherry Blossom Ceramic Shotglass. Even though we didn’t really see cherry blossoms there, I still found these things more fascinating than everything else that I saw at the shop. And, just so everyone knows, I collect shot glasses. But, yes, I will actually use that shot glass. It seems pretty fitting to drink sake with plum wine in this. 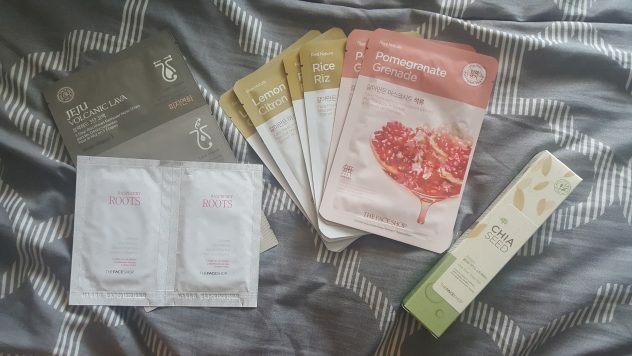 My pick-ups from The Face Shop: Pomegranate, Rice, and Lemon face masks; Jeju Volcanic Lava 3-step nose strip pack, Raspberry Roots collagen eye patches (for these long nights of video editing and late blogging); and Chia Seed Watery Eye & Spot Essence. Along with my pick-ups above, I got some freebies. Who doesn’t love getting free stuff? My tiny haul from Lil’ Thingamajigs: Monsta X Shine Forever Repackaged album, BTS You Never Walk Alone album, 2 EXO Chanyeol and 2 BTS V waterproof stickers, and 2 jewelry rings. 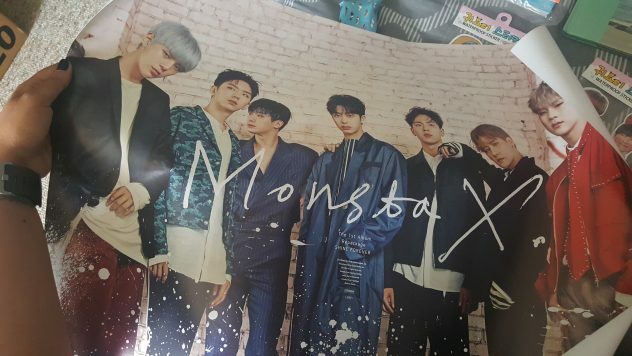 With my Monsta X album, I got a free poster! But I don’t have any more room to put up this poster… not with all the BTS and EXO ones that I have.